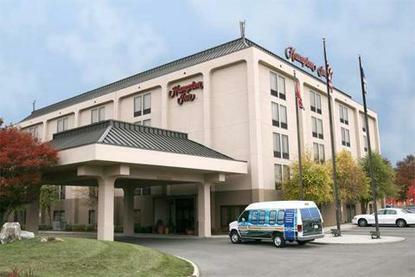 Hampton Inn Knoxville-Airport is located in the city of Alcoa, 10 miles south of downtown Knoxville, directly across from the McGhee Tyson Airport with a scenic view of the Great Smoky Mountains. Nearby attractions include 5 golf courses within 1.5 miles, University of Tennessee (10 miles), Maryville College within 5 miles, and the Knoxville Zoo within 15 miles. You can dine at Applebee's, Bel-Air Grill, McDonald's, Taco Bell, Subway, Wendy's, Pizza Hut, and China Garden II all within a .5-mile radius. Amenities include complimentary continental breakfast bar, free airport shuttle (within 5 mile radius), and pay movie/Nintendo services. We also offer connecting rooms, cribs, fitness center, irons & ironing boards, and outdoor pool. Our two meeting rooms can accommodate up to 30 people theater style catering is available. Laundry/valet services, meeting/banquet facilities, and audio visual equipment are available for a nominal fee.